WHETHER YOU ARE LOOKING FOR A NEW WILDLIFE POND, A BEAUTIFUL LAKE, PERRY JAMES PONDS AND LAKES OFFERS THE COMPLETE PACKAGE FROM THE INITIAL DESIGN CONCEPT THROUGH TO COMPLETION. From Concept to Creation, we are specialists in the Design and Construction of Wildlife Ponds, Beautiful Lakes and Vast Winter Storage Reservoirs. Whether you are looking for a new garden pond, a Beautiful Lake or a vast winter storage Reservoir or any water body for that matter, Perry James Ponds and Lakes offers the complete package from the initial design concept through to completion. Creating all kinds of waterscapes custom built to your requirements including supply and install liner service, water features, decks, bridges and jetties. 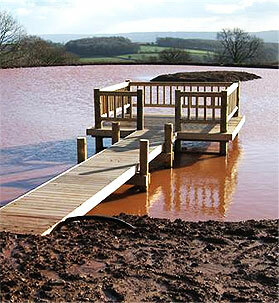 Swimming pool ponds, de silting and refurbishments. Perry James creates and constructs the projects himself giving a personal hands on approach and takes great pride in being able to offer a professional efficient service with 40 years experience and knowledge of the processes involved. 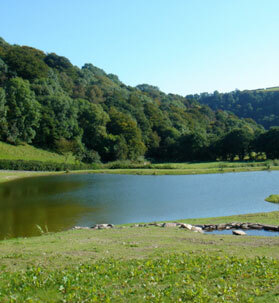 Every pond and lake we have constructed, and lined has been a successful installation and we have turned an unsuitable piece of land into a valuable asset. Getting a new project built right in the first place is so important, and we appreciate your project is an important investment to you. Every part of the process is carefully thought out and managed, combined with this personal attention to detail and only working with one customer at a time, you are assured of a first class quality job where ever you are, that will be built to last and guaranteed to stand the test of time, and the Great British weather! 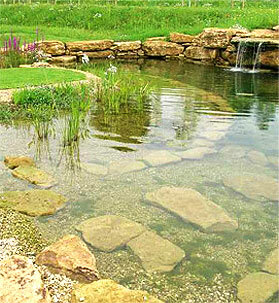 Every Pond or Lake we have constructed or refurbished has been a successful installation. We’re fortunate to have been able to work on some fantastic projects, and have an extensive portfolio of work from clients in the south west and surrounding areas. Our clients have always been 100% delighted with the finished results and would recommend us to anyone. Perry James gives a personal service with a hands on approach and constructs all waterscapes and associated work from conception to completion himself. With meticulous attention to detail, along with a professional team and suppliers, he works with one customer at a time until the project is complete. He is good at listening to your ideas giving you the best of his extensive experience, making sure you get the best Pond or Lake you could wish for with your hard earned investment. Getting everything right is crucial. The groundworks and drainage and a well prepared surface base is the key to producing a high performing liner installation, resulting in a first class durable and ultimately a fabulous job. Because we design and construct your waterscape personally, every part of the process is carefully planned, managed and thought through. From the planning stages and ground work construction, through to the logistics of getting the materials transported and delivered to where we want them on site, to the final and finishing stages of topsoil and landscaping. 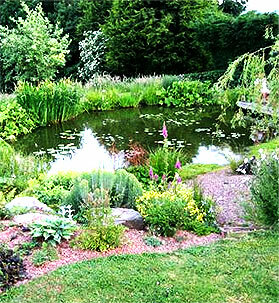 Whether it's a brand new Pond, a beautiful Lake or a refurbishment, Perry James gives a high level of customer service, sound advice and peace of mind and fully guarantees all of his work. It couldn’t be simpler. I will arrange to visit you for an initial site visit where I will be happy to guide you through the different stages of your project. 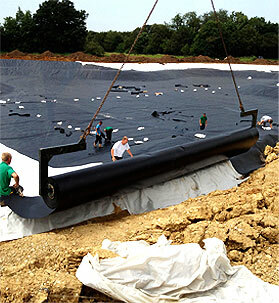 This will give you an opportunity to discuss your proposed pond or lake, its position and its size and advise on the different types of welded liner we use if clays are not available best suited to your feature. We can walk over the site and discuss the ground conditions, measure the slope of the site, check access into the proposed site for transport and for all the equipment and materials. Everything will be fully explained to you. We have to consider the environment and the ecology of the area, any drainage or ditch issues for the underliner drainage requirements and any flooding problems that might want prior attention. We might have to consider any maintenance issues concerning the area around the feature, and removal of any trees and hedging that would be in the way and the entrance to the site. We can also discuss the possibilities of having added features such as a waterfall feature, a deck or bespoke bridge made out of oak. Plants, wildflower meadows, trees, tracks, hardscaping and car parking and landscaping the area, the disposal of soils on site to reduce costs and finally landscaping to make everything look natural.